The Schooner Club held the first of three scheduled 2 on 2 events on January 4 and 5 at the club. A full roster of 16 teams took part, this time being picked via a random draw of the thirty two players who signed up as single entries. In the past, these spiels have been run as team entry. The spiel was restricted to Schooner members. Play got underway on Friday evening with all sixteen teams scheduled to see their first action on day one. Winners would stay in the main bracket while losers would drop to the consolation bracket. In this double knockout format, a first game loss on Friday meant teams could not lose again or they would be eliminated. Play got underway Saturday morning with play in the Main bracket starting at 11am and continued all day, leading up to the championship games in each bracket that were scheduled for Saturday evening. After a weekend of great curling and a lot of close games, the championship game in the main division came down to Richard Lorway and Cal Thistle taking on Gary Landry and Brian Laughlin while in the consolation championship there was Russell Fitzgerald and Greg Wall taking on Joe Erickson and Rick Windsor. The Game between Lorway/Thistle and Landry/Laughlin for the overall championship was won handily by Lorway/Thistle but the consolation game was decided by a draw to the button. Both team members would have one rock and the cumulative distance would be calculated. In the end it was Russell Fitzgerald and Greg Wall taking the win with the best team score, even though Rick Windsor had the best draw and pretty much covered the button with his stone. 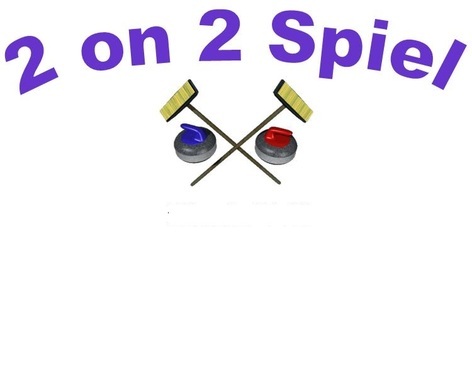 A big thank you to everyone who took part in the spiel, to the spiel committee for another great job organizing and running the event and to everyone else who helped out in any way. Thanks to Tommy Young for once again providing great food for the event and to everyone else wo helped out in any way. Join us again in March for the next 2 on 2 event. The rules are a hybrid based on standard doubles curling with a few changes.